WASHINGTON, DC, March 28, 2011 (ENS) – The U.S. Supreme Court today declined to hear an appeal from Kaiser Ventures LLC on an appeals court decision overturning a federal land exchange. The land deal would have allowed the world’s largest garbage dump to be built on the boundary of Joshua Tree National Park. The Mojave and Colorado deserts and the Little San Bernardino Mountains converge within California’s Joshua Tree National Park. Environmental and community organizations have contested the Eagle Mountain Landfill for 18 years because of the adverse impacts it would have on the national park. “The Supreme Court’s decision not to hear this appeal is great news for all of us who care about Joshua Tree National Park,” said David Lamfrom, California Desert Program Manager with the National Parks Conservation Association. The Joshua Tree, Yucca brevifolia, is a member of the agave family, used in many ways by native Americans – tough leaves were worked into baskets and sandals, flower buds and raw or roasted seeds were eaten. 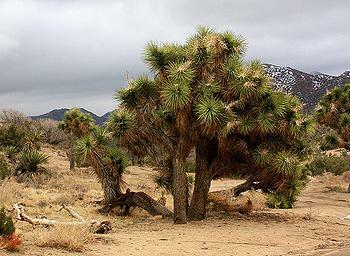 Joshua trees provide habitat for numerous birds, mammals, insects, and lizards. Since 1988 when the Kaiser Steel Company came out of bankruptcy, the former steel giant has been focused on redeploying its assets, one of which is Kaiser’s former Eagle Mountain iron ore mine, located in the remote eastern Riverside County desert, 150 miles east of the Los Angeles basin on the edge of the national park. The idea was to build a regional landfill capable of processing up to 20,000 tons of waste per day for 50 years. In August 2000, Mine Reclamation reached agreement to sell the Eagle Mountain Landfill to the Los Angeles County Sanitation Districts for $41 million. Kaiser completed a land exchange with the U.S. Bureau of Land Management for the Eagle Mountain landfill project. But the initial closing of the sale has been delayed by litigation. The land exchange was challenged in U.S. District Court by the National Parks Conservation Association, the Center for Community Action and Environmental Justice, the Desert Protection Society and Donna and Lawrence Charpied. In September 2005, U.S. District Judge Robert Timlin ruled that the land exchange was not properly approved by the federal agency. Kaiser and MRC took their case to the U.S. 9th Circuit Court of Appeals. On November 10, 2009, the 9th Circuit Court of Appeals issued a final ruling against the land exchange. Kaiser and MRC appealed to the U.S. Supreme Court and it was this appeal the high court decided not to hear, allowing the appeals court decision to stand. The successful environmental groups say the Eagle Mountain Landfill will not be needed. They point to the new Mesquite Regional Landfill in Imperial County, which is scheduled to come online this year and operate for 100 years with a permitted disposal capacity of 20,000 tons per day. Served by rail and truck, Mesquite will have a surplus of waste disposal capacity through at least 2018, the furthest year out in the Los Angeles County projections.